Recommended Citation: Mulvenna, A. (2018). ‘I’m still, here: shadow portraiture as creative spatial practice in research with children’, entanglements, 1(2): 67-88. They are interruptions and absences, [restricted] responses, marking our shifting between embodied subject and immaterial reverberations upon other material surfaces. When we look back and see, our shadows we might ask: what do you tell I, what do you see still me – outside myself? And are you ‘owned’? Who sees you? Who makes? ‘I am Big’ positions himself against the wall, chest puffed out and arms confidently poised; his hands on hips at jutting angles, stretching outwards. Caoimhe, the photographer, is a few years older. She waits for him to ready himself. Camera in hand, she creeps backwards just a few steps. The corridor is narrow, and the darkness is a little disconcerting to navigate, I expect. ‘I am Big’ proudly calls aloud and C makes the shot. He darts immediately across to her to view his shadow portrait, shrieking excitedly, “ Oh my GOODNESS! I am Peter Pan!” Caoimhe’s eyes lift upwards and she gently smiles at me, then eyes back to the image. Both are crouching tightly over the lens, marvelling at their making. The lively co-existence of light, darkness and dancing shadows in the opening scene of J.M. Barrie’s Peter Pan invites readers to adjust to the playful and fantastical realm of the narrative that follows. And it is a similar excitement and intrigue that connects the shadowy goings on in the Darling’s nursery in Barrie’s London with the animated squeals of this young participant at a youth centre in present-day Belfast. ‘I am Big’ is seven, and lives in West Belfast. This is not his real name. Indeed, my project field diary abounds in an eclectic mix of anonymised names. There are many, many unicorns and some slime princesses; several Béyonce’s, Mo Salahs and Lego ninjas and more: all pseudonyms that connote the significant and varied material resources of childhood cultures prevalent at the time the project was carried out (October 2017-June 2018). In re-naming themselves, participants undertook the initial steps to affirm themselves as creative personalities without revealing their identities. The shadow-portraits were the next phase in the creative process of affirming participation and co-authorship, as well as disrupting conventional ‘schemes of perception’ pertaining to the research process (Cresswell, 1996). In the words of ‘I am Big’: “the point [of shadow-portraiture] is for people to see the personalities of us.” In this expérience, I discuss the creative and ludic practice of shadow-portraiture; specifically, how we used tools (i.e. cameras) and our bodies in spaces to innovatively think through and affirm ideas around creative authorship and anonymity in the context of participatory research creation with children. There are several key elements in this process, including: participants, light source (torch), intensity of light, surface mediums (wall, floor, door, etc.) and the materiality of those textured surface medium. These will be discussed together more fully in part two. I want to begin however by very briefly affirming the beauty of this mode of authorship, which is that those shadow(s) selected by children really became their unique icon; a resonant and effervescent texture that many felt an affinity towards. The practice of making the portraits also indicated that something important was at work in the spaces of research creation. Indeed, the process was as significant as the resultant portrait. For one thing, they were always different. Other practices of anonymisation (i.e. pseudonyms) connote a stuckness and a stillness: being captured and fixed within text; a linear mode of representation. Conversely, in our process, we went back to the body, taking seriously the material environment also (Horton & Kraftl, 2006b; Hultman, 2011). The changefulness of the shadows in the photo-events affirms the whimsies, fancies (and fantasies!) and exorbitant liveliness of the participants’ intra-actions within the spaces wherein they felt and moved, played and mingled with myriad other bodies, moment-to-moment (Barad, 2003; 2007). In part one now, I explain the basis on which this practice was chosen and developed (which includes the ethical questions it highlights), and offer some context from contemporary Art. In part two, I present and discuss some empirical vignettes from my field-diaries, with tentative analyses. creative ways to take pictures of ourselves and others that told a story about who we/they were without revealing their identity. In taking up shadow-portraiture, I was very much inspired by the inventiveness of the Connectors Study and those artists that endeavour to challenge voyeuristic access to the image prevalent in contemporary media society. In an ‘academic’ sense, too, I was also thinking of the anxieties concerning representations of childhood and childhood tropes and how we as researchers working with young participants ought to respond to this (e.g. Katz, 2008). I was also compelled to respond to wider, ongoing concerns around data, consent and creative authorship that have promulgated in the wake of recent demands concerning EU law on data protection and privacy (the General Data Protection Regulation, GDPR), enforced on 25 May, 2018. This law issues that consent to the processing of child data must be obtained from the parent or guardian. Member states may determine the age limit for consent between 13 and 16 years of age. This law also aims to take account of the need for special protection for children (in the research process, for example), and to limit the use of children’s personal information. The ethical responsibilities of the researcher has thus become more pressing than perhaps ever before, particularly given the concurrent move towards variously ‘creative’ and ‘visual’ methods in research with children within the social sciences and beyond. Experimental approaches to research creation require criticality and reflexivity when thinking about how to best represent children and young people’s voices and facilitate expression and participation (including that which is non-verbal), understanding that bodies, spaces, tools and media are agentic in and of themselves and invariably shape the ‘doings’ of research. This is discussed by geographers invested in non/more-than-representational theories (e.g. Anderson & Harrison, 2010), and is being increasingly considered by children and youth geographers (and beyond), particularly since Horton and Kraftl’s (2006a) clarion call for ways of “doing children’s geographies differently”. One third and final reason sparked my uptake of shadow-portraiture. During my initial embedding phase across the field sites (two primary schools and two youth centres across East, West and North Belfast), I became aware of the political connotations of the spaces. More expressly, I realised that these were not ‘just’ spaces of learning, formal and informal, but rather political spaces, “where life takes place and where politics happens” (Albrecht-Crane & Slack, 2007:99). Since January 2017, Northern Ireland has not had a Power-Sharing Executive. This political stalemate, compounded by the effects of austerity in the UK more broadly, has resulted in sizeable cuts to funding for after school clubs and other children and youth services (Martin, 2014). Some have folded. Many more have had to drastically scale-back facilities provided. I observed the impact of the cuts across the sites I visited. In most for example, there were little to no art materials and other play resources. And yet, a scarcity of material resources did not delimit what the children could do within their material environments. I witnessed much resourcefulness and inventiveness during my initial field visits: children drawing on empty paper bags left over from their break at the tuck-shop; bringing in home-made slime to trade and sell during after school club; making patterns on the red brick walls of the youth centre with white chalk stones. Across all sites, the children used what little they had around them for entertainment and expression –and indeed for profit! The co-production of shadow-portraits were therefore intended to be more–than-classroom/youth centre practices, partly in recognition what the children were already doing with/in the spaces; i.e. making something from nothing – a kind of poesis as it were. While such inventiveness is not peculiar to these children in particular, I felt that the sites themselves merited a special attention to the material elements of these spaces and affects circulating therein: a more-than-human ethnography as it were. Going forwards, my key focus in this expérience is less the ‘completed’ visual images themselves and more on the liveliness of the processes and practices around making the shadow-portraits. This speaks partly to Noora Pyyry’s (2016) reflections on the use of photography as a research method with teenage girls, specifically the ways in which it might work beyond the purely visual; i.e. a mode of ‘sensing with’ the world, as Pyyry puts it. Pyyry’s thinking – and my own – aligns with Eva Änggård’s (2015:9) discussions around digital cameras, photos, and child participants’ activities connected with these “performative agents”. And I further seek to respond to Kim Kullman’s (2012:3) concern around what she perceives as “a tendency among childhood researchers to move directly to images and their meanings while leaving actual practices of picture-making unexplored.” By foregrounding the very active practices of photo-making, this expérience pays attention to material aspects of research creation with children, wherein light, darkness and half-light play a changing and active role. I lead with a selection of excerpts from my field-diary, immediately followed by short analyses, focusing on stillness, movement, embodiment and affect. Mac & LegoMan ‘do battle’ when in front of the camera, their play-fighting takes on a urgency as they cast themselves as doubles in the scene, body on body – shadow on shadow. Every few seconds, they pause to turn their heads to admire their other selves against the wall. When the two boys are apart, a kind of solemnity descends. LegoMan runs skittishly off and Mac turns his body sidewards then stands still, alone now in the frame, directing his gaze out through the wall of windows and upwards, out onto the tall mountains behind the youth centre with a proud pensiveness, I perceive. In this art room at the very top of the building, Mac is elevated like the mountains that tower above Belfast and the watery landscape of the docks in the far distance. Arms folded tightly, chin jutting upwards and out – defensively, confidently? – revealing sharply defined angles – of jawline, nose, chin and neck. I have felt something of the sharpness of his tongue before(! ), but this shadow before me is something else. I am unnerved by how mature he looks. LegoMan suddenly quirks back into the frame to poke fun and all tumbles into relative chaos again. Another shadow event involves an entanglement of children, dusty stage curtains, wall hung radiators and the darkened gloom of the school gymnasium – wherein lurked the school ghost, I was told. We stand in the school gym, lights switched off, curtains drawn. (The participants have guided me on how to control the lights!) The space reminds me of the gym from my school days – everything down to the scuffed wooden parquet flooring rings familiar. All of a sudden, a body takes off and leaps onto the stage before darting behind the stage curtains: “this is the best place, we’ll get our photos in here!” I am suddenly nervous now, being here with a bundle of excitable primary sevens who know the space so much better than I do – and who are rarely let ‘loose’ from the classroom during class time, as I am told by another adult. No-one is paying attention to me. Others take off now, running and crashing into the heavy fabric of the stage curtain, making whooping, shrieking noises as they are absorbed by its weight and the wonder of it. “It’s haunted, you know, Amy!” My torchlight seeks out wayward bodies as the ghosting goes on. Hair very literally stands on end as girls extend their bodies and we make the portraits – all the while they are whirling, dancing in and out of the frame, insisting on the ghost being there too. The photo-events described above were two of many that led me to thinking: how are participants’ bodies affected when encountering each other, and when encountering light and darkness as well as the tools of photography? In other words, what can shadows do? To be sure, the process of co-producing the shadow-portraits depended on how we each of us encountered the camera and the environment (in the first instance, the art room and the mountains beyond). To this end, both movement and stillness were crucial and most active elements of the child/researcher/camera event. We encountered stillness and movement together via the light and darkness, and those entities and textures cloaked within (Lisle, 2011). And we created shadowy perceptions together via the subtle balance of moving and being still. Participants did not ascribe meaning to spaces during these events; rather, both stillness and movement can be coded as creative, enchanted modes of becoming with the more-than of these shadowy spaces; terrains that yield a whole range of affects (Deleuze & Guattari, 1987). These photo-events open up understandings of photography as a more-than-representational, more-than-human practice that brings to the fore relational agencies of other non-human things (Alam et al., 2017). In both moving and being still, participants highlight and are highlighted by other bodies in the environments and their becoming-with; in Mac’s case for example, the mountains that stand behind the youth centre, and, in the case of the ‘ghostly’ photo-event, the heavy, musty velvet fabric of the stage curtains and elevated flooring entangles multiple participants in a kind of collective, performative storytelling, whereby they take delight in trying to glimpse the ghost – or, like ‘Bow’ in figure 4 – stretch and expand her body to become more ghost-like! (See figures 4-6, above). Shadow-portraiture thus redraws spaces as ‘in-between’, insofar as participants are affected by other bodies and non-human things (both real and imagined) that they themselves affect (Deleuze & Guattari, 1987:257). To be sure, shadow-portraiture enacts processes of defamiliarisation – literally seeing oneself in an-other form; a dislocation of self-perception and self-knowing. As poet A.E. Hamilton put it: “This learned I from the shadow of a tree/That to and fro did sway upon a wall:/Our shadow selves, our influence may fall/Where we can never be.” Shadow-portraiture therefore rescripts existing ideas about the use of photography as (purely visual) research method and tool insofar as it opens up different modes of engaging with the more-than of the classrooms and after-school club rooms, as well as other bodies within those spaces that have the capacity to both affect and be affected. To this end, it lends itself to an enchanted view of dwelling not dissimilar to what Noora Pyyry (2017) recognises in young children’s engagement with the mundanity and peculiarity of (urban) spacings. As method, shadow-portraiture characterises or enacts engagement with the surreality of the everyday; that is, a blurring of lines between those mundane activities and particularities of the everyday with the unexpected, the imagined, and the otherwise uncharted. It is not only about ‘seeing things anew’, asCecilie Sachs Olsen (2016) writes: I believe it is also about sensing anew – which includes sense of belonging and recognising oneself. For my part, I see several possibilities in the shadowy interactions and intra-actions that initiated the defamiliarisation processes. For one, it was especially significant coming as it did right at the beginning of the research process, because it enabled participants to co-create fun and safe spaces in which to introduce themselves to me (and to each other, in some cases) and begin to share little life stories in performative and embodied ways that add to and affirm their creative authoring, as I now discuss. “…the concept of story focuses attention on the relations between personal experience and expression and its broader context, and upon the interpretation of those relations” (Cameron, 2012:579). The potential afforded by story and storytelling approaches is foundational to the social sciences. I am particularly interested in how these approaches map onto the material and relational turn, which concerns how to gesture towards concepts like affect, emotion and embodiment in academic writing. Within cultural geography (my own field of interest), Hayden Lorimer is a notable advocate of what he terms ‘small stories’. He contends that small stories can both complement and disrupt so-called ‘large-scale’ discourses; i.e. through rich descriptions and attentiveness to the particular and everyday, which can permit movement between “different scales of enquiry – here, the institutional and the intimate – and between previously disparate practices – here, the academic debate and the embodied experience” (2003:200). Discussing Lorimer’s writings, Emilie Cameron (2012:577) argues that, far from being stable and closed, small stories are characterised by “a kind of heterogeneity, materiality, sensuousness, and openness”. In my own fieldwork, the small stories activated or enabled by shadow-portraiture tell of a play with possibilities (i.e. small stories becoming tall stories!) and descriptions of relations between bodies and things. They evolved from participants’ inclinations to chatter, self-narrate and describe while at the same time deciding on poses and locations. As I dim the lights, torch in hand, Kria takes off, tumbling and cartwheeling along the corridor and calling behind to myself and a small handful of other children. Watching, marveling. She does not slow. Feet first, then head, then feet – arms stretched out confidently as she navigates the length of the narrow, dim corridor. At some point in all of this turning and flipping she decides on her pose: an upside down shadow portrait! “Because I’m not from Belfast, I’m from Derry!” Carefully, deliberately, she manoeuvres her feet up, up, up the wall; the grip of her woolly tights is more than tested as hands over-compensate to steady, taking her weight. The scuffed lino flooring is pock-marked with fluff and dead flies and waxy crayon ends. Her fingers sidestep these, feelingly. Kria’s upside down shadow-portrait tells the story of her desire to map herself beyond Belfast; to engage with a somewhere else that matters to her. While she currently lives in Belfast, all her affiliations lie within Derry – in fact, she communicated this to me practically every session during our ten months together! While climbing the wall, feet first, she explains that her life can be upside down: “sometimes I’m here and sometimes I’m in Derry – I’m turning my me-map upside down.” Her story moves me; her portrait affects because it translates that which is felt and most personal. Derry is Granda, Granny, fields and wide summer skies. All participants are invited to make a series of poses that I explain as a way of making sure they are noticed for all the imaginative, intricate and most active making and doings that comprise our research project. In Kria’s case, like so many other participants, her very playful mode of self-presentation is a particularly powerful catalyst opening up to a sharing of personal experience narrative. She openly reflects on her specific ‘standing’ in the world as she sees it, using her body and the materiality of the space around her to articulate what Cameron (2012:57) would describe as those “relations between personal experience and expression”. In part, Kria’s form of storying speaks to the cultural tradition of shadow and puppet theatres popular across Thailand, Burma, Indonesia and Cambodia and much of the near and Middle East for example, where audiences have long been thrilled by sacred stories and fantastic myths of dream-like worlds. In addition to being a catalyst for small story sharing, from the outset, shadow-portraiture also disrupted the usual ways that participants used and categorised the spaces wherein we met and did our making. This disruption or destabilisation transpired in various forms of making and remaking – sometimes arbitrary, and at other times intentional – whereby participants focused attention on ways in which the surrounding spaces and things could be co-opted into the frame. For example, the flaking paint of a wall or the crack of light that crept through a doorway. 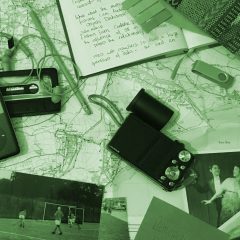 Having the relative freedom to choose where and how we photographed in spaces familiar and personal to them enabled participants to begin to question what research creation and artistic authorship meant for them. A further consequence of their portraiture-creation was the creative unfolding of a multiplicity of other spaces within a social space familiar and relevant to them: what I call the little geographies of the (photographic) frame-scape. These little geographies in turn brought participants into myriad and complex entanglements with the affective charge and surreality of their everyday, as discussed earlier. In other words, both the cameras and photos brought out new and unexpected ways of seeing and sensing things that might have otherwise been regarded as mundane or insignificant. For instance, the thick velvet curtain in the school gymnasium became entangled in the makings of a ghost story that dramatically vivified field relations, which in turn complements Noora Pyyry’s (2016) consideration of photo-walks (with teenagers) as creative encounters with city spacings, nurturing enchantment, and fostering different ways of ‘doing’ children and youth geographies(Horton & Kraftl, 2006a). With this in mind, I recognised that shadow-portraiture was a good reference for forging spaces wherein the young participants felt safe and affirmed, inspired and enlivened. It afforded them an ability to conceptualise, vocalise, and self-identify as creator/thinker and enabler. But my involvement in the processes of portrait-making was also a mode of breaking my own habit of mind as a former primary schoolteacher-come-researcher – a hyphenated sensibility that can be difficult to grapple with – particularly when doing experimental, exploratory research with children and young people. Observing and actively engaging with the making and doings enabled me to attune to both the spaces of research creation and levels of participation as constantly shifting and situated. In particular, attending to the tools of making (i.e. cameras) was an important mode of noticing the making and unmaking of relations within the field. This parallels Kim Kullman’s (2012) findings from her creative photographic research on children’s school journeys in Helsinki. When it was me behind the camera lens, being directly involved in the actual photo-event, I keenly sensed and responded to those moments when movement conceded to stilling of action: hence, I too played a subtle-yet-active part in the shared poetics of stillness. While observing on the other hand, I encountered stillness and the borderlands of movement quite differently. When situated on the periphery of the photo—making event so to speak, deliberately trying to maintain a position of non-authority, I was more attuned to fragility and instability – chaos even! There were many occasions when I had to check my own participation and forego my instincts to ‘look after’ in order to maintain a distance, not intervening when bodies and tools teetered and wobbled – and sometimes took a tumble. The cameras mediated the relation between participants and myself in other ways, too, opening up avenues for playful resistance. For instance, in the ghosting episode in the school gymnasium, participants chased after shadows in a space usually associated with supervised and controlled physical activity. With the lights off at certain points, and having only my torch-light for guidance, the entire dynamic of both the space and researcher-participant relations transformed. In ‘giving chase’ in the gloom, the children were actively making contact with torch-light and other children, leaving me with the camera behind. One could say they were counteracting the purpose of our being there (that is, to capture shadow-portraits against the walls). And yet, somewhat ironically, it was at such times when the camera lens was not being pointed at them that my gaze was, in a sense, ‘redirected’. That is, when the children evaded the focus of the camera lens, being involved in intra-activity with all the performative agents aroundabout them, I was witness to play cultures that emerge. These included all manner of things in the participants’ physical environments, which themselves intra-act with school stories – like the very agentive ‘ghost story’ (Barad, 2007)! POSSIBILITIES III: TRANSFORMING THE EVERYDAY – A POLITICS OF CHANGE? Shadow-play and portrait-making can also make possible the performance of alternative subjectivities within environments both familiar and unfamiliar. This enactment hinges on an openness to creativity and difference, understood in the Deleuzian sense that posits all ‘reality’ as flux, changefulness (1994). Anna Hickey-Moody (2010) outlines these concepts succinctly in relation to her research with young people involved in arts programmes in Australia and in the UK. She explains the Deleuzian account of creativity as “active engagement with the differential becoming of the world and resistance to cliché” (Hickey-Moody, 2010:205). She notes that, according to Deleuze, humankind is “overly occupied with proving our imaginings of ‘the way things are’…because of this, we lose the capacity to pay attention to what things are becoming” (2010:204). This is a question of creativity as slipperiness and resistance to stasis: a redirection of one’s gaze from the homogeneity of the present to seek instead the potential of people, places and things. For instance, shadow-portraiture permits rethinking and reframing children’s senses of ‘identity’ insofar as it allows experimentation with, and even resistance to, image-as-construct. As a practice, shadow-portraiture affirms the potential of both the individual and the collective to make and remake an-other self while also making new connections with spaces and things in the process. This process is also very similar to the method that Cecilie Sachs Olsen (2016) terms ‘materiality as performance’, which is a method of exploring the creative possibilities of material things, including tangible and potentially throwaway objects, and putting them to new uses through making, remaking and unmaking, to transform and express anew their potential. Sachs Olsen explains this method as a way of “stepping back from the real without losing sight of it. This therefore allows participants to imagine alternatives that are rooted in, but not limited to, the present” (ibid., p.37). In practice, this could involve participants model-making with junk or found objects in order to re/create or re/imagine environments significant to them, which was the case with Sachs Olsen’s research with children, teenagers and adults in Monthey, Switzerland. In playing and making with throwaway ‘stuff’ during the hands-on workshops, Sachs Olsen describes how participants reacquainted themselves with other urbanisms in their city; i.e. alternative ways of knowing and going that fed into the creation of the imaginary city of ‘Montopia’. In Belfast, participants likewise engaged in a process of reimaging/reinventing, playing within parameters of everyday material environments to cast anew forms of self-knowing and being-there through making and remaking their shadow-selves. As previously discussed, making the portraits involved an element of destabilising (participants’ understandings of) surrounding spaces, as well as those relations between participants and myself within the field. In editing the photographs next, another angle of changefulness came into play. Shadows as (im)material forms could be re-imaged and/or reinforced through experimentation with the camera’s editing functions; e.g. tools for cropping, sharpening and blurring, etcetera. My understanding of performance (centred on world-making and world-sharing) chimes with those editing processes which upheld nothing as ever fixed or stable; rather, all was subject to change where subjects themselves were open to change and re/invention (quite literally). Nearly all of the children showed a keen interest in the editing process. It was at this stage in the process that participants shifted positions as actors and producers in the photo-event. Some children chose to stop and admire their portraits after each was made. Others would go for up to five minutes at a time, posing and playing with their shadow before moving away to speak with the photographer (either myself or another participant). Interestingly however, none chose to make shadow selfies! Thinking more broadly, I wonder: how might shadow-portraiture cast itself forwards, towards hopeful geographies of change? It is, I argue, both an entangled form of storytelling and mode of creative subjectivation that inheres in gesturing towards a hoped-for future. As storytellers, participants might communicate desires for hoped-for future public(s) that strive to take seriously feelings/emotions – and consequences (Cameron, 2012). I offer an example from the field to explain. I was particularly struck by the number of children who, when invited to explore ideas for making their shadow portraits, began by grouping together (usually two and three persons) – and not always in existing friendship cliques. Nearly every time this happened, hands and fingers reached together carefully, and hearts would take shape. Figure 8, below, depicts one such instance during which time the girls kept exchanging glances between each other’s faces and the shadowy, hand-made heart on the wall behind them, grinning widely as they gazed. These moments were compelling to witness: often the children would initially come together very tentatively, sometimes awkwardly, shyly. Making contact was typically a wordless connection, as was the decision of what symbol to share (if any). The prevalence of hearts as choice of symbol, the care with which they were held up before the camera lens, and the pride displayed on grinning faces left little doubt in my mind that for these participants, what I call comingtogetherness in these spaces really counted for something. The schools and youth centres were sites that enabled spaces for connections that mattered, and it was these emotional matterings that many participants wanted to reflect in their portraits; i.e. how, for them, emotional connections can sustain and enable. Immediately after the photograph above was made, the girls moved slowly apart and as they watched their shadows draw away, fingers uncurling from the heart, they realised another form that their friendship could take when apart. Below (figure 9) is the result: one of several ‘shadow birds’ made as their hands moved apart-together. Bow: The sky gets bluer. As shadow birds moved, the girls reflected that “good things happen and not so good things. Every (..) single (..) day. Amazing. The birds can see it all.” They chatted on, making clear what they would want from their ‘tomorrow’ neighbourhood: the ‘good’ things they would choose from all that the birds look upon (which rubs against the other forms of surveillance discussed) – that is, those hopeful geographies of change. Attempting to reposition participants’ photo-making along with (politics of) representation, this article brings together concepts of affect, movement and stillness, materiality and agency through initial empirical analyses of participants’ shadow-portraiture and shadow-play. I have discussed ways in which the emergent and affective geographies of shadow-play and shadow-portraiture challenge notions of photography and portraiture as entirely representational practices. And I further discuss ways in which these geographies might challenge not only cultural norms of how portraiture ought to be done, but also ethical norms of how authorship and anonymity can be practiced and interpreted through the entanglement of the child-camera-researcher event. There should be no distinction between this form of photography and the messiness and ongoingness of everyday life process I argue, because they commingle so closely through performances like movement and gesturing, and events like thinking, perceiving, reflecting and storytelling. Crucially, the shadow-portraiture I mobilised with participants is practice-oriented, which chimes with recent research into non/more-than-representational theories and children’s play (Harker, 2005). Recognition of their part in the process and practices of making was immediately obvious to all of the young participants, and gave them a sense of accomplishment because shadow creation is a non-judgmental process: they were not bound by any ‘standard’ or ‘criteria’ of assessment schemes that significantly moderate the value of art education in both UK schools and further afield. Furthermore, I maintain that by going back to the body from the outset, researchers can really enrich the participatory research process. The practice of shadow-portraiture offers participants opportunities to perform more inclusive notions of identities that materialise and shift within the research space, and create new spaces for research creation. As I see it, this process is a directed, expressive and affective interest between humans and more-than-human things that foregrounds the entangled relationship between researcher/participant/tools as ‘spaces of creation’ in and of themselves (Nanni & Houston, 2006:9). It is a mode of storytelling that enables and enlivens. Certainly, for me-as-researcher, shadow-portraiture redirected my gaze, lifting scales from my eyes in terms of allowing me to attend to spaces and situations wherein creativity can happen. In the words of ‘I am Big’: ‘the point is for people to see the personalities of us’. Regardless of age, artistic competence and ability, shadow-portraiture opens up making to all bodies, and affirms all environments as “creative triggers” (Hickey-Moody, 2010:204). And more broadly, it promotes more divergent thinking about creativity in response to the challenges met where funding for youth and arts provisions seems ever-more hard-to-reach. Albrecht-Crane, C., and Slack, J.D. (2007). ‘Toward a pedagogy of affect’ in A. Hickey-Moody, and P. Malins (eds.) Deleuzian encounters: studies in contemporary social issues. Hampshire: Palgrave Macmillan, pp.99-110. Anderson, B. and Harrison, P., (2010). Taking-place: non-representational theories and geography. London, UK: Ashgate. Bissell, D. and Fuller, G. (2011). Stillness in a mobile world. Abingdon: Routledge. Cresswell, Tim (1996). In place. Out of place. Minneapolis: University of Minnesota Press. Deleuze, G. (1994). Difference and repetition (French, 1968). Trans. Paul Patton (English, 1994). New York: Columbia University Press. Deleuze, G. and Guattari, F. (1987).A thousand plateaus: capitalism and schizophrenia (French, 1980). Trans. B. Massumi (English, 1987). London: Athlone. Hultman, K. (2011) “Barn, linjaler och andra aktörer: Posthumanistiska perspektiv på subjektskapande och materialitet i förskola/skola [Children, rulers and other actors: posthumanist perspectives on subjectivity and materiality in pre-school and school].” PhD thesis, Stockholm University. Lisle, D. (2011). ‘Moving encounters: The affective mobilities of photography’, in D. Bissell and G. Fuller (eds.) Stillness in a mobile world. Abingdon: Routledge, pp.139-154. Nanni, L. and Houston, A. (2006) ‘Editorial: heterotopian creation: beyond the utopia of theatres and galleries – site specific performance’, Canadian Theatre Review, 126, pp.5-9.